Introducing My Hero Academia FiGPiN Series 2 from CMD Collectibles! 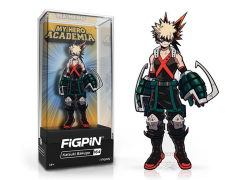 Featuring Bakugo, Aizawa, and Ochako, FiGPiN is proud to bring to life these fan favorite characters as character-perfect pin art. Each premium hard enamel pin comes with a custom display backer so they can stand anywhere! FiGPiNs are packaged in premium jewel case collector packaging with their own unique serial number. Unlock each one in the FiGPiN app! Every FiGPiN includes custom display backer so you can stand them anywhere! Every pin has its own unique serial number that you can unlock in the FiGPiN app!